The Canary bird is set aside from other pet birds because of their beautiful singing ability. Canaries are known for their beauty and their song and have been kept as pets since the 1400s. They are not companion birds and are better admired from afar, but this doesn’t make them any less of a great pet. They do spend a lot of time in their cages, so you need an adaquately sized cage with perches on either end to provide them with maximum flying space. If you want a Canary that sings, you will need to find a male. If this is very important to you, you should arrange ahead of time with the breeder to be able to return the bird if it proves to not be a singer. Keep in mind that males sing to attract females, so they should not be kept in pairs. They also don’t sing in the summer because it is molting season. We have also heard to not put mirrors in their cages because Canaries are very territorial and they may see this “second bird” as a threat. The most commonly kept Canary birds are the American Singer, the Border Fancy, and the Red Factor. The American Singer is a song Canary (well known for singing), the Border Fancy is a type Canary (a popular type), and the Red Factor is a color Canary (well known for color–the more red, the more valuable). 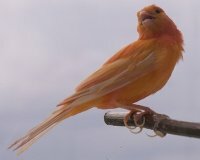 Color Differences Canaries are commonly yellow, but they can also be red-orange, white, pink, and many shades of brown. Abilities Low–they don’t talk, learn tricks, or cuddle. However, many have a beautiful song. Interaction/Time Requirements Low–they do well on their own and don’t usually interact with people. Diet They need a diet for x-small pet birds. Supplies Needed They need supplies for x-small pet birds. 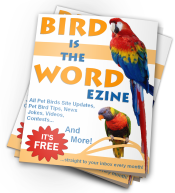 See How Canaries Compare to Other Types of Pet Birds! Video by tossy002This is a great video that truly shows the range of the Canary’s song. Video by anonymousartistThis is another video of a Canary singing that shows they don’t all sound alike and that pet Canaries sing indoors as much as they would outdoors. Have A Great Story About Your Canary? Hope someone can find out why my canary isn’t singing , he use to . About a month in a half now he has not sang he is molting too, if this is the reason why , whe will he sing. He use to sing sooo pretty all the time . He eats and otherwise happy. Some males can stop singing when molting but after that they should return. To his happy self. Our Canary opened his cage and flew away. All the windows and doors were open and we felt so sad thinking that he would never come back. After a few hours, we were surprised to hear him singing near his cage. We tried to catch him but he flew around and entered every room in our home. So we decided to hide behind the sofa and watch him. After we closed all the windows and doors he entered his cage by himself to eat some food. We were so glad he was back! Well, I was starting to say that I was not a pet lover. I don’t hate or harm animals – I just don’t want any smells or messes in my house. Dad used to have a small male yellow canary which he loved a lot. Last year, Dad was seriously sick and knowing he had some weeks left to live he told me to please take care of Rocky (canary) and not to let him die. At that point, I promised him that I would take good care of Rocky. A few weeks later, Dad died, and I’ve been taking good care of Rocky ever since. I placed him at an eye level height in my study and I changed the cage to a more adequate one and now I cannot live without him. He’s part of me and he gives me company. When I talk to him he actually sings back – he’s a very sweet little creature and I cannot imagine life without Rocky. Dad would be glad I guess.